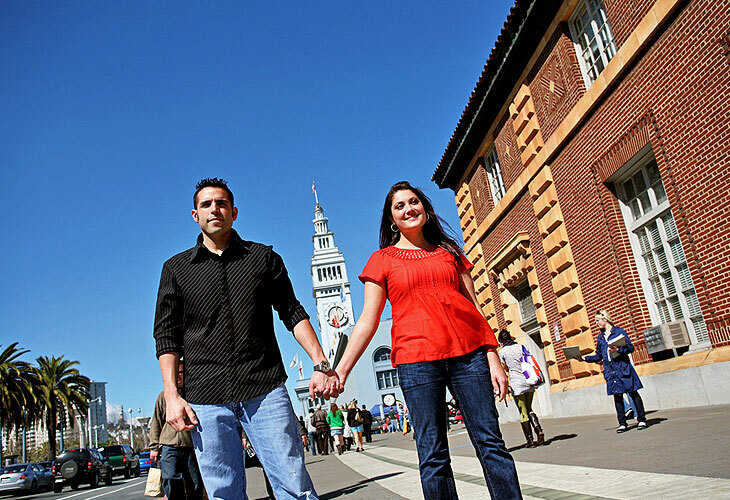 Without a doubt, San Francisco inspires romance, and this magnificent City offers many remarkable locations for your engagement photography session where you and your fianc'e can capture this special moment in your lives. Begin your engagement photography session at the Lyon Street Steps, a dramatic location that offers soaring views of the Presidio and the City below. Here you will find many different opportunities to create memorable pictures ' from intimate close ups, intriguing poses accented by magnificent architecture, to breathtaking panoramic vistas that take in the iconic beauty of one of the world's most beautiful cities. Take a short stroll through the neighborhood to find surprisingly lovely settings to create different moods before you go to your next location. Down the hill from the Lyon Street Steps you can indulge in romantic nautical fantasies at the San Francisco Marina. Here you will find majestic views of the Bay behind you, as sea birds wheel in the blue sky above and the boats bob gently at their moorings. The Marina Green Park is right next to the yacht harbor and offers many fabulous locations to capture casual and playful moments together. Next, take a trip around the world without leaving San Francisco and take a short drive over to Japantown where you will find traditional Japanese architecture, culture and many unique settings in which you will be able to take remarkable pictures. Wrap up your engagement session in style, with photos that stir the imagination and capture the passion you both share. Get your engagement photography session off to a delicious start at Ghirardelli Square. Indulge in some romantic close up shots as you share a sundae and savor delicious chocolate-dipped strawberries from the world-famous chocolatier. Have some pictures taken with classic red brick buildings in the background and take in gorgeous views of the San Francisco Bay before you stroll over to your next location. The Maritime Museum is a place where you'll find timeless scenes ' where historic sailing vessels, gentlemen playing bocce ball and magnificent views of Fisherman's Wharf, Alcatraz and the Golden Gate Bridge await you and your loved one. Walk along the waterfront where unique settings will reveal themselves to you and street performers provide lively entertainment. Here you can capture spontaneous and vibrant moments that will last a lifetime. From here head back up to the quaint and romantic Russian Hill Park, where expansive views extend in several directions across the Bay Area. The neighborhood around the park features delightful Victorian homes, charming stepped streets and numerous opportunities to capture eloquent images of the two of you in love. The soft afternoon light makes for especially romantic moments, and if you time your shoot into the sunset you'll be rewarded with a dazzling and jewel-like display as the City lights up below you. There is a very intimate location where romance flourishes and the views are truly incredible. Land's End lets you take in spectacular views of the Pacific Ocean and the Golden Gate Bridge as you stand on the edge of the continental U.S. Rugged and stunningly beautiful, Land's End provides you with settings that feature magnificent views of the sweeping coast of Northern California. Below the famous Cliff House you will find the ruins of the old Sutro Baths, an astonishing and unique setting for engagement photography. A place where cypress trees reach towards the ocean from the cliffside above and the sound of crashing waves echo off the walls of the ancient structures. Take a leisurely stroll along the beach and dip your toes in the surf as your photographer captures the unforgettable feeling of being in a special place with the one you love. From here take the short drive and head out onto the Golden Gate Bridge, one of the world's most beautiful bridges and an international icon. The Golden Gate Bridge offers panoramic scenes that are unmatched in their scope ' with the City to one side and the vastness of the Pacific Ocean to the other, you and your fianc'e can pose for intimate close-ups and wide-angle panoramic shots with the entire Bay Area in the background.